Worldly Muslimah: Boston Marathon Attacks: Foreign Terrorists or Sick Americans? Boston Marathon Attacks: Foreign Terrorists or Sick Americans? 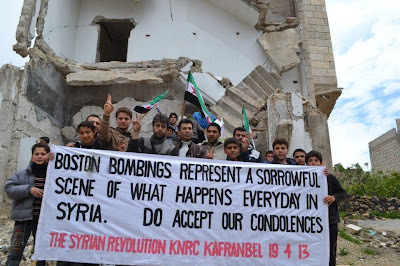 With sinking trepidation in my heart, I perused the news about the recent Boston marathon attacks. It was almost inconceivable that this had occurred in a city so dear and near to my consciousness – a city that had left its indelible presence on my very being. This was the city where I had experienced many firsts from the insignificant first date to the momentous first car purchase to the financially empowering first real job, and innumerable other firsts; it was my home for more than one third of my life. Boston was never the glamorous Los Angeles, nor was it the exciting New York that everyone knew and dreamt about. But to me, part of Boston’s charm was in its unchanging quiet strength. Now the world’s eyes are upon this city, and sadly for all of the wrong reasons. The reaction to the attacks has been predictably swift. Instantly, there were speculations that this was an act of terrorism by foreign perpetrators. Scores of Muslim Americans, and Muslims worldwide instinctively braced themselves for a backlash, while hoping that the perpetrators would not happen to share their faith. Muslim organizations, no less the Islamic Society of Boston Cultural Center, felt compelled to issue out strong declarations of condemnation, lest there were doubts. Within days, troubling news reports emerged of people of Muslim ethnicity being targeted: Muslim women in their give-away headscarves being harassed and threatened; Muslim man beaten up in New York; and false accusations of being the marathon perpetrators. One of the more troubling reactions to me was that of a young Saudi Arabian foreign student who happened to be at the scene. He found himself under scrutiny almost instantly by a fellow bystander who had tackled him after the attacks because he had been acting "suspiciously" before and after the attacks. Despite being injured like so many of the other spectators who were unfortunate enough to have been there that day, he, unlike the others, was interrogated, and then had his apartment searched. He was labeled as a potential suspect, and had his name and his Facebook pictures propagated by certain segments of the all-too-eager and all-too-willing new media, despite statements to the contrary by law enforcement. Hours later, it became apparent that the Saudi student had nothing at all to do with the attacks. His "suspicious" behavior notwithstanding. Outside of the US, another kind of reaction is gaining traction. As soon as the news of the Boston attacks hit, people began tweeting and forwarding news reports that 30 children and women at a wedding in Afghanistan had been killed by US air strikes on the very same day! The emphasis was on whether it was justified that this news went under-reported while the death of one child in Boston was at the foremost of the news. Was the life of an American child more news-worthy (and hence more valuable) than one of an Afghan child? The incident in the widely circulated report turned out to have actually occurred in 2002. Still it takes nothing away from the main point – a quick check of recent news pulls up disturbing information. For instance, just recently, on April 7, 2013, 11 Afghan children were killed in an airstrike by US-led NATO coalition forces. And as anyone that follows the news would know, this is not an isolated incident, but as a result of a systemic NATO plan of dealing with insurgents in Afghanistan with airstrikes and drone attacks. Civilians are often caught in the cross-fire. Most of us know this happens. And most of us choose not to react. Our eyes gloss over the news reports of deaths of innocent civilians. After all, this happens in faraway lands where violence is part and parcel of life there. But when it happens in familiar ground, in lands that are most like ours, only then do we pay attention. As it is with me. I cam across one picture of a man whose leg was torn by the bomb blast, his arteries clearly visible. This was one image that was actually befitting the usual graphic advisory warning. This made me think about the many lost limbs elsewhere too. 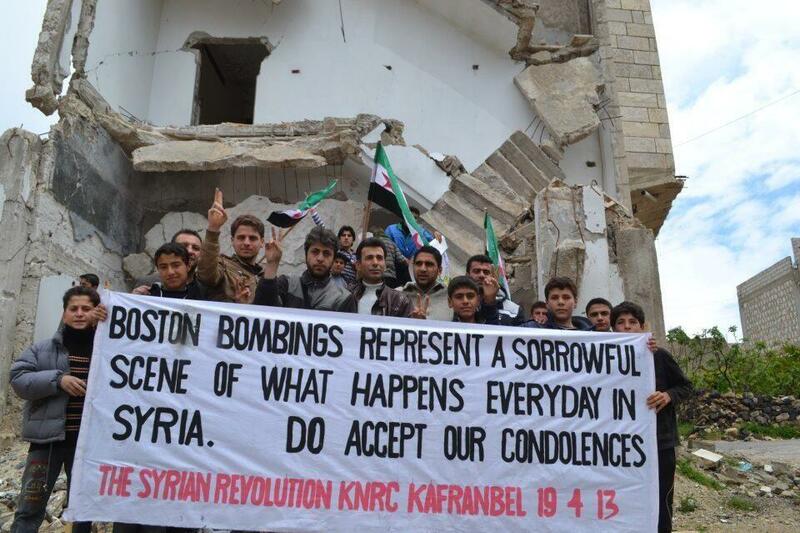 Above, a picture of Syrians showing their solidarity Bostonians. It does not matter who did this - so this dichotomy of who could have possibly done such a dastardly act - foreign terrorists OR sick Americans that does not exist. Whatever the perpetrator's motivations are, anyone who wished harm on innocent people in this way have to be sick in their minds. So ultimately, these perpetrators, whoever they are, are simply sick terrorists. We need to check ourselves and our reactions when such unfortunate incidents happen. Stop. Be human. It isn't difficult.